Halifax, for those who don't know, is a harbour city. Halifax is on one side of the harbour, Dartmouth at the other, with Bedford up at the inside tip of the harbour. Driving from one part to another is a pain, but the city doesn't have it all figured out in terms of transit. There's a ferry across the harbour, but no easy way to get from Bedford into the downtown core. Perfect opportunity for private enterprise to fill the gap, and Skipper here has just the solution. Bring your own bucket. Traffic woes, no worry! Expedited ferry service from Bedford to downtown Halifax. Luxury and economy class offered on our 3.6M inflatable vessel. Snack service available depending on the weather and availability of “day olds” at Tims. 8 - 12min depending on wind direction and load vs the 45min you normally spend in your car! Enjoy the scenic view along the coastline and participate in our scavenger hunt for beach whistles and almost extinct brown trout now that the treatment plant is up and running again. 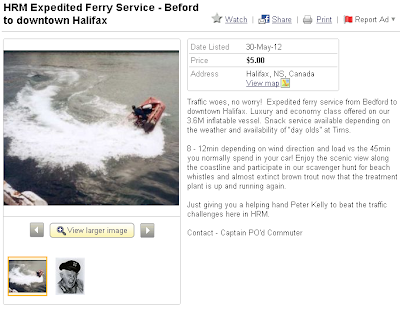 Just giving you a helping hand Peter Kelly to beat the traffic challenges here in HRM.